For anyone, anywhere, it can be a serious challenge to live a more sustainable, compassionate, mindful life. Often, doing so requires being willing to tweak traditions and get creative in order to maintain a cruelty-free lifestyle, while also recognizing that there is (or at least should be) more to being vegan than just not eating or using animal products. Veganism at its core recognizes the right of other beings, and the planet, to be healthy and to receive our respect and equal consideration. Taking veganism in this spirit means asking questions about sustainable production, fair trade, food/shipping miles, packaging, lifespan, biodegradability, and more, not just if there is meat, milk, or other animal parts in your food. For my wife and me, an important aspect of taking veganism beyond diet (sort of) has been “veganic” gardening as a way to grow more and more of our own food. We live on about one-fifth of an acre in a semi-rural small city, which has its multiple challenges for eco-conscious (just say it: “hippie”) vegans. But to grow more grub, we are slowly but determinedly turning grass, beds devoted to ornamental shrubs, and even a gravel driveway into productive space with various delicious fruits and veggies. Our goal is to have nearly the entire yard consist of either an edible forest garden (in front) or mixed perennial/annual beds (in back), giving us either fresh or preserved food throughout the year. Unfortunately, for some people–including vegans–there is still a divide between “friends” and “foes” in the natural world. We humans bandy pejorative terms about, in the process condemning “pests” and “weeds” and “varmints” to disfavor and death on the one hand, and relegating “food animals” (for non-vegans) and “food plants” to merely utilitarian existence on the other. Or, we let others, the farmers, do it for us with the consent of ignorance. That is not compassion…that is anthropocentric selfishness. With a little more mindfulness, though, anyone can make growing food a practice in compassionate, sustainable vegan living. It takes some re-visioning of gardening techniques and resources, but research and creativity makes it possible to give up any pesticides, even natural ones, and not deliberately kill insects. For example, instead of spraying an aphid or squishing a squash bug, try to raise healthy plants and take advantage of natural plant repellents instead. To prevent exploding weeds and avoid harming soil organisms, it helps to disturb the soil as little as possible, so use sheet mulching and minimal digging when you plant rather than large-scale tilling. I am fond of letting “weeds” like clover grow among the fruits and vegetables in the garden, only clipping them if they crowd out one of the edibles; this makes for a good living mulch, since clover is a nitrogen fixer, and green manure source, and the plants seem to like it. 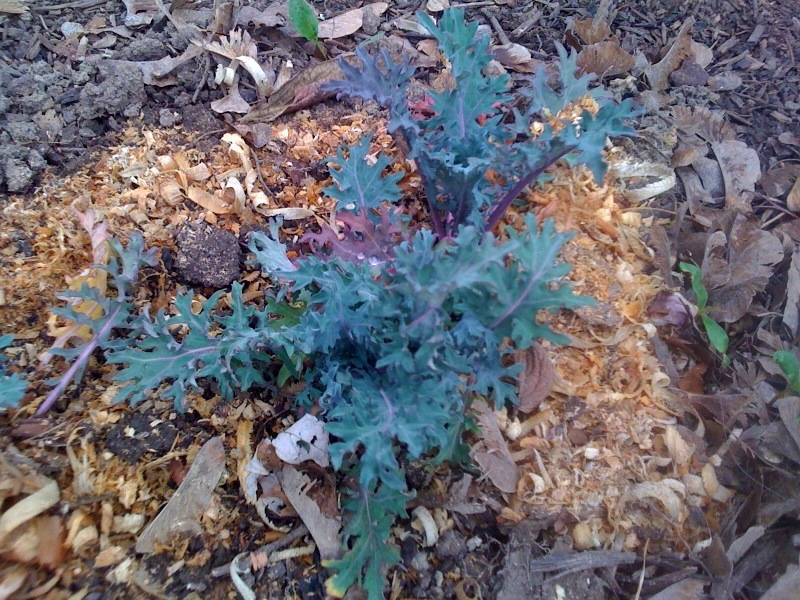 Then there is companion planting and “guilds” as ways to combine natural qualities for mutually beneficial coexistence. Veganic gardening may not yield as much as conventional or organic methods, and we are still experimenting with a lot to learn what works best for sustainable production. But as we nourish ourselves, we can provide nourishment, habitat, and resource conservation for the benefit of other animals and plants. Even the pests, even the weeds, and of course the Earth all deserve this sort of respect and consideration from us…the one species in all of this planet’s history that has done its damnedest to push all natural systems and all its fellow living beings to the brink of chaos. When one goes vegan, one takes a huge stride away from the selfish, speciesist machine of cruelty and mindless consumption. But we must never stride and then stand, smiling with pride, while there is so much still left to be done. To truly live in harmony with the intent and heart of veganism, we also must look closely at how every aspect of this human life impacts other creatures and the planet. 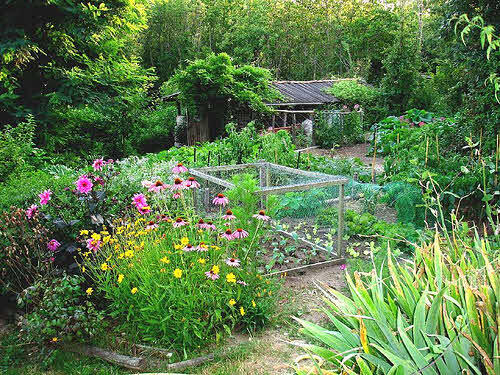 Veganic gardening is an exciting and fun way to bring production and consumption back as close to home as possible, allowing one to foster a vegan mindset while using veganic practices. In future posts, I hope to explore the idea of uniting a vegan lifestyle with a locavore’s recognition that food (and other products) grown close to home can be more sustainable–both ecologically and economically–than our typical methods of consumption of anything from anywhere. When we try to grow food in a truly compassionate way, we confront the truths of being vegan: that we are not perfect and can always be doing something better, while always examining, questioning, and reflecting on situations at hand and how to respond to them without selfishness. Being vegan, after all, is not a fixed state or stasis point. It is a constant process of evolution beginning in an internal state of compassion and respect for all creatures. And from that seed grows a wonderful, nourishing fruit.